Corum 999.9 Pure Gold 10g Ingot Bar Wrist Watch. The Strap is Black Leather Crocodile with a Gold Plated Corum Buckle, The Case is Rectangular 18k Yellow Gold Measuring 21x34mm. 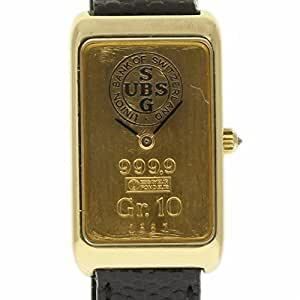 The Dial is a 999.9 Pure Gold 10g Ingot Bar with Gold and Black Baton Hands, Stamped Union Bank of Switzerland. Quartz Movement. This watch does not include original Box or papers. We will provide you with an Invoice from our Store, also a 2 YEARS Warranty on all Labor, an appraisal for insurance purposes.